Vice President, Northern Community Investment Corp.Cathy Conway was pursuing an engineering degree at the University of New Hampshire when she met her husband, a dairy farmer from Jefferson. His occupation simplified her decision to move to the North Country. “It was easier for me to move up here than for him to move 100 cows,” said the mother of three, who is vice president of economic development at Northern Community Investment Corporation, which serves the state’s northernmost region.
? 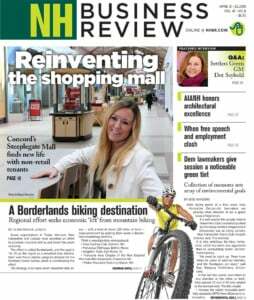 New Hampshire Grand, a marketing campaign that’s resulted in more than 400 articles published about the North Country and a 10 percent uptick in rooms and meals tax revenue in the region. Another major initiative Conway has undertaken is helping the city of Berlin tackle its housing crisis. Her efforts, which included winning several grants, led to the hiring of a city housing coordinator and elimination of much of the city’s blighted housing. As Patrick MacQueen, Berlin’s city manager, wrote, “It is pretty amazing how someone who works so quietly behind the scenes never seeking recognition or credit can make such an impact on a community.”Q. How did you end up where you are today in your career? A.I started getting into grant writing in addition to design work and project management. I found that a lot of communities couldn’t do what they needed or wanted to because of lack of funds. The engineering world wasn’t as flexible as I would have liked it to have been as my family grew. As I got more involved in grant writing, I became public works director for Littleton, and from there I got into NCIC. A. One of the biggest challenges probably was early on in my career being a female in a male-dominated industry. My first job was working for the Department of Transportation as a construction inspector. I was in my 20s, fresh out of college, reviewing the work of contractors who had been in the business forever to make sure it met the specifications, so that wasn’t always easy. Even today, folks in the North Country are a proud group of people. They don’t always like to accept money from other resources, they want to be able to do it on their own, but it’s just such tough economic conditions up here that we do need to reach outside for that assistance. A. When I first started, I really didn’t do a very good job of it, because work always came first, unfortunately. But I think that having a supportive network of family and friends helps, and also my current boss has said more than once, if you don’t have a balance between family, fun and work, it doesn’t work. Over the years, Duprey has worked on the campaigns of Congressman Charlie Bass, former Gov. Steve Merrill, President George W. Bush, U.S. Sen. John McCain, and Congressman Frank Guinta. This year, she has reprised her role as a sought-after political consultant this primary season as Ann Romney’s chief of staff. For many people, those roles would constitute a full-time job, Duprey is also an attorney and shareholder at Devine Millimet, the largest law firm in New Hampshire. There, she is a noted attorney whose expertise in land use and zoning law has landed her inclusion in The Best Lawyers in America every year since 2007. Duprey is also a past president of Devine, where she has worked since the start of her law career. During her seven-year tenure as head of the firm, Duprey was instrumental in establishing its reputation as one of the best in the state. She even oversaw the firm’s physical transformation, with an historic renovation of the firm’s downtown Manchester building. Duprey’s accomplishments have certainly not gone unnoticed by her peers. As fellow Devine attorney Teresa Rosenberger — a 2011 Outstanding Woman in Business — wrote, Duprey is “a shining example of how to lead and support.”Q. How did you end up where you are today in your career? President, Normandeau Associates Pam Hall’s personal interests align so perfectly with her professional pursuits that she has a difficult time deciding whether the numerous environmental boards she sits on qualify as work or play. The president and CEO of Bedford-based Normandeau Associates began her career in 1971 as a marine scientist at the natural resources management firm. Armed with advanced degrees in the sciences and business, she quickly moved up the company ranks, becoming its president in 1987 when it was a division of a large publicly held company. And when that company decided to divest Normandeau, Hall led the charge in buying it and turning it into an employee-owned company in 2000. Since then, annual sales have nearly tripled from $10 million to $29 million, it’s established a dozen and a half offices nationwide and has grown to employ about 250 people. And when the recession hit, Hall made the decision to cut where she could — including her own salary — to retain Normandeau’s entire staff, even making key hires to help the company emerge from the recession in a strong position. Hall was one of the few women at the firm when she started in the ’70s, and the only woman in senior management in the ’80s. Today, women make up half of Normandeau’s management team and 45 percent of its professional staff.Q.How did you end up where you are today in your career? A. I started off my career as a zoologist, then got a master’s degree in zoology and was in the Ph.D. marine program at UNH. I took a leave of absence from there to actually work at Normandeau Associates in 1971. During the ’60s, there was a lot of change in this country and in the world, and the environmental field was really just starting. I thought with my science background and my interest in the field, this would be a great natural fit for my career and my personal interests and passion. I could really improve the environmental quality with my scientific training. I was very much of an idealist, thinking all these problems could be solved in 10 years. It was just becoming apparent to people that we needed to do something about all these environmental issues. A. One of the challenges for me has always been that my interests just merge so much with what some people would regard as my work. Most of it really isn’t work for me. It’s what I love to do, and the challenge comes in trying to fit in even more, trying to do even more stuff. How many boards can I be on? Because it does take up a lot of time. The only other major challenge certainly has been being in a profession where there are very few women, in science and later on in top leadership positions. You’re always sort of under a magnifying glass if you try to blaze the trail. Q.Did you have a professional mentor, formal or informal? I really haven’t. Even when I was a kid, I wasn’t afraid to try things that other girls wouldn’t do. In the company, these challenges would come up, or some tough project, and I would just always take the stuff on. I didn’t start off with my sights on being president, but through a lot of hard work and really volunteering for the tough tasks and sticking with it, I ended up with the job. Q.How do you balance your personal and professional lives? A. There’s a significant amount of overlap because I don’t consider a lot of the things I do as work, because I love what I do. I think I have a pretty good balance and actually consider myself really one of the lucky people to be able to do the things I’ve been doing. New Hampshire president, People’s United BankAfter graduating from college, Dianne Mercier didn’t know what career path she wanted to pursue. So upon a friend’s recommendation, she landed a position as a bank teller while she awaited her calling. Mercier assumed the role of president in 2009, a transformative time for the bank as it underwent its name change from Ocean Bank and the recession took its toll. 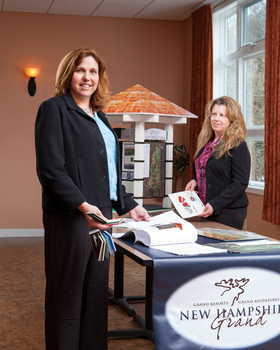 Mercier has worked tirelessly to elevate People’s corporate brand throughout the Granite State. As president, she has launched a new small commercial lending program, solved an employee turnover problem, and established an annual giving day to support nonprofits across the state. More than 10 of some of the state’s most prominent businesspeople wrote letters in support of Mercier’s nomination, pointing not just to her professional success but her unwavering commitment to community service. The wife and mother of two serves on the boards of New Hampshire Public Radio, Rivier College and the Elliot Hospital — among many, many others — and has helped with the capital campaigns for organizations like the Food Bank and the Boys and Girls Club of Manchester.Q. How did you end up where you are today in your career? A. Banking is a remarkable industry. It is one of those places where you can absolutely get an entry-level position and work your way through a company over time. I am what I am 28 years later, but it’s been a succession of new opportunities in new divisions and different people willing to teach you. Q.What have been some of the biggest challenges to getting where you are today? A. My challenge in my life has been getting the answer right to the balance thing. Having priorities for me is knowing what’s important, and being able to recognize being busy versus being effective, and understanding what’s urgent versus important. When you don’t understand those things, you can get lost in minutiae, especially other people’s minutiae. A. I never really was attracted to the formal mentor relationship. I really prefer the natural kind of relationship that doesn’t have a lot of hierarchy to it. I appreciate peers exchanging ideas — those have really been the most important to me, the relationships you have on a day-to-day basis. A. It’s very simple, but it’s very hard. Simple is not the same thing as easy. The best way is to try and not overly complicate the thing. I can really only juggling three big things at a time, and today, for me, those things are my family, my work and my community service, so a lot of stuff that doesn’t fall necessarily in there, that gets pushed aside in the nice-to-do but not must-do category. You learn to say no to the things that crowd out those priorities. A. There are very few really big decisions in your life. The really important stuff is the result of all those little decisions you make — Should I go to that event? Should I participate in this fund-raiser? — those little things add up to so much more than big, important decisions ever will. Vice president of program, New Hampshire Charitable FoundationIf it weren’t for the hard work of Katie Merrow, the Outstanding Women in Business Awards might not well exist today. NHBR was inspired to launch the awards in 2006 because of the early work of the New Hampshire Women’s Policy Institute, which highlighted women’s vital contributions to the state economy. As senior research associate at the New Hampshire Center for Public Policy Studies, Merrow helped to promote the findings of the institute’s early research. She was then appointed the Women’s Policy Institute’s first executive director, and under her hand, it grew from startup to a respected source of unbiased data that informed public policy decisions on women’s issues. Today, Merrow works to support and develop the state’s nonprofit sector as vice president of program at the New Hampshire Charitable Foundation, one of the largest community foundations in the country. She oversees 18 staff members and is responsible for about 4,500 grants and scholarships totaling $30 million annually. I really built on that more in my work at the Center for Public Policy Studies and New Hampshire Women’s Policy Institute, where I learned to use information to bring people to the table over an issue. A. Probably my earliest inspiration came from my grandmothers. One was one of only two women to graduate from her graduating class at MIT, and worked as an engineer at General Electric in the 1920s — which was no mean feat, I’m sure. My other was one of the most industrious and creative homemakers I’ve ever known. A. I’ve really achieved balance by sequencing. I’ve done that with the help of an incredible and wisely supportive partner, my husband Jed. There were times I pulled out of the workforce and worked part time. It’s not easy to make those transitions, but it is possible, and it can be done, and that’s how I’ve done it. Women do it all kinds of ways. A. Figure out what you’re good at, then work to get better at it, then find a way to use that to help your community. Director and CEO, Currier Museum of ArtSusan Strickler is a self-proclaimed “migrant worker” of the museum world, starting out as a college intern actually helping to install artwork on the museum walls. Since Strickler joined the state’s largest independent art museum, she has worked doggedly to expand its reach beyond Manchester to communities statewide, offering outreach programs to the Seacoast, Monadnock, Capital and Nashua regions. Strickler also spearheaded the planning of and fund-raising for the museum’s $21 million, 33,000-square-foot expansion, which made the museum 60 percent larger and immediately brought a major uptick in attendance. Responding quickly to the downturn, Strickler cut the Currier’s operating expenses without disrupting its core activities. As a result, the museum’s operating budget has maintained a surplus in each of the last three years, while membership has continued to rise.Q. How did you end up where you are today in your career? A. In my senior year in college, I met the widow of an important artist who helped me to get a job at the Delaware Art Museum, which is about the size of this one. It’s very unusual to get a job at a museum with just a B.A., so I had a chance to try it out, and really fell in love with the notion of being able to work with art objects. From that I decided that’s what I would like to do in greater depth, so I went to graduate school and have been working in museums ever since. A. Trying to understand what I do and how it’s perceived by staff — it can be a very public job, and you have to be more self aware all the time. A. Here in New Hampshire, several of our board members have been terrific. Kim Zachos and Dave Jensen have both been terrific in terms of leadership and management — they’ve just been good mentors, and sharing experiences or helping figure out what is it we really want to accomplish. A. I think that’s something that comes perhaps with maturity. When I was a young curator, my life was my job and I loved it, and I produced a lot of exhibitions and publications. As I’ve found other interests — and I am a single person, so I could spend my entire person doing my job — I’m not my happiest when I’m finding that work is it. I’ve made it a more definitive part of my life to take a trip somewhere outside the States every year. President and CEO, New Hampshire Public RadioOther than a sister who lives in New Hampshire, Betsy Gardella didn’t know anybody in the state when she accepted the position of president and CEO of New Hampshire Public Radio. This community outreach has defined the Hopkinton resident’s time at NHPR, which she joined in 2005 after working for American Public Media in Minnesota. Upon arriving at NHPR, she recognized that the station’s aging studios and out-of-date technology were limiting its capabilities to meet the needs of citizens in the state. Also since she arrived, NHPR has won national grants to fund the popular program “Word of Mouth,” as well as its Public Insight Network, which invites commentary from local listeners to aid on-air reporting. The station also recently invested in new power transmitters in Colebrook and Littleton — efforts that help the station reach 90 percent of the state’s residents. More programming and more reach has meant more people tuning in, with the number of weekly listeners growing from 117,000 to 170,000 during Gardella’s tenure. And under her guidance, annual revenue has increased by more than $2 million. Lew Feldstein, one of Gardella’s nominators, wrote that she has been “absolutely critical” in establishing NHPR as the premier statewide media outlet, and the only one that “touches virtually every community” in New Hampshire. It is her entrepreneurship and forward-looking vision for NHPR that led Centrix Bank to select Gardella as the first recipient of its C-Beyond Award.Q. How did you end up where you are today in your career? A. I started working in public radio at WNYC in New York City. That was a very exciting opportunity for me, because that organization was going through a huge cultural shift, and I really like change. That was a very great time, and my family would still be in New York if it hadn’t been for 9/11. That had a powerful effect on my family. I had a young daughter on the time, and we decided it would be a good time to relocate. A. The changes in technology and the speed at which new technology is being adopted by consumers presents a challenge to everyone in business today. How do we keep up with consumer expectations without comprising the quality of the work that we do? We’re very focused on two things looking forward — creating more local content and building our digital infrastructure. A. Happily, during my daughter’s middle school years, my schedule was very flexible. I felt those were important years, particularly since we made this move to the Midwest. My parenting philosophy has always been, ?Just say yes,’ so even if I’ve had a long day but she wants to go to dinner or see a movie, I just say yes, and it’s worked pretty well for us.